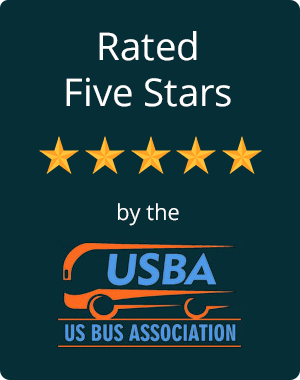 In need of charter bus transportation in Tempe, Arizona? Phoenix Charter Bus Company has all of your group transportation covered, from private trips to business meetings to sporting events and more! Trust us for all of your travels in Tempe and the surrounding areas. Just east of the city of Phoenix, Tempe offers easy access into Phoenix as well as unique attractions that are perfect for groups staying in this charming suburb. Visit the Sea Life Arizona Aquarium for a day of fun with your school group or family, shop ‘til you drop in the Mill Avenue District, or take a tour of Arizona State University. No matter what brings you to Tempe, Phoenix Charter Bus Company will make sure you’re chauffeured in comfort. Choose from a variety of bus models, including spacious motorcoaches, compact minibuses, and multiple sizes in between. If you’re not sure which bus is right for you, our 24-hour reservation specialists will work with you to find the best rental for your group’s needs! You can also enjoy modern amenities such as air conditioning for the desert heat, WiFi, reclining seats, televisions with DVD players, and more to make your trip to Tempe as comfortable as possible. Book your own bus for easy travels throughout Tempe and in surrounding areas such as Glendale, Mesa, or Scottsdale. Got a group of high-school seniors who are curious about ASU? Tour Arizona State University’s campus with a private minibus from Phoenix Charter Bus Company! Let a professional do the driving so that you don’t have to worry about navigating through campus while you explore your students’ future home. We’ll make sure you arrive on-time to campus tours, team try-outs, and more for a memorable tour of ASU. Whether you’re headed to a campus tour, a business event, or a sporting event to support the Sun Devils, rely on us for charter bus transportation you can count on. Transport your group with ease with a private bus and personal driver at the wheel. We’ll shuttle you to your most important ASU campus events and ensure that your group always travels in a timely manner through Arizona State University and across Tempe. During your stay in Tempe, don’t miss out on everything the city has to offer. The Sea Life Arizona Aquarium is home to 26,000 square feet of interactive aquarium exhibits, perfect for school field trips or groups of families and friends. Legoland Discovery Center Arizona is filled with family-friendly exhibits such as a 4D movie theater and a LEGO factory tour. If you’d prefer to spend some time outdoors, check out Tempe Town Lake for a beautiful waterfront view. For Tempe’s best shopping, restaurants, and bars, check out Mill Avenue District with your group to create lasting memories on your Tempe trip! Phoenix Charter Bus Company is available to handle all of your group travel needs in Tempe, Arizona. Give our 24-hour team a call today at 480-445-9823 to learn more about how to book a charter bus and to receive a free, no-obligation quote for your trip!